#BB Slam season two will be holding alongside the 13th edition of Be Blessed (poetry and sundry talents event). The first edition was done with a winner takes all approach, where Prestige Ifeanyi won a Tablet. But this time finalists have better things to strive for in that the prize will relate to promotion of their Spoken Word poems and alternative ways of utilization in film production. Reasons: Things may go very bad with us at times, it’s part of life, but can we still keep hope alive even when all indications say we shouldn’t? 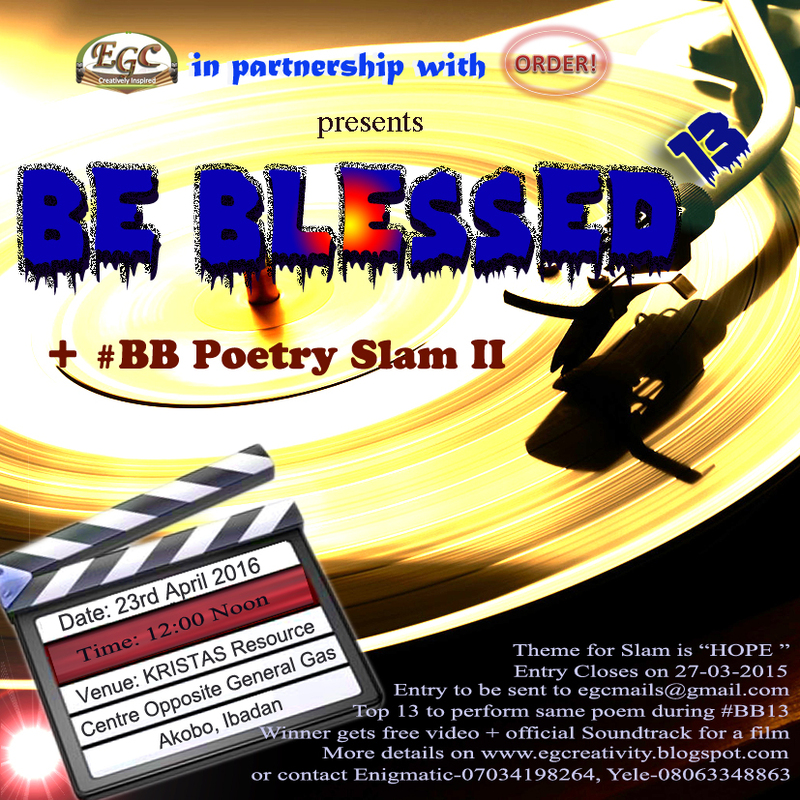 The call is to write “a message of hope with a poem” and be able to perform same poem if selected for the finale to be held on 23rd April 2016 in Ibadan. Eligibility: This competition is open to everyone. Finale Selection: Submissions will be judged blindly by a team of Spoken Word Artists who themselves are good writers of Poetry. They will select the poets to advance into the Spoken word stage. These Poets will be announced on EGC blog before 23rd April 2016. There is actually no requirement other than your poem, but the following might be put into consideration. · -All entries must address the theme, HOPE. · -All entries must be sent to egcmails@gmail.com with subject ‘BB Slam II’. · -Only one Poem per Poet is allowed, and Poet must be able to perform same on 23rd April 2016. · - Entrant must also prepare to perform at least two other poems, on any theme, as situation on final day may require such. · -All entries might come with 50 words short profile of entrant. Legal: By submitting, each entrant agrees that the submission is original and does not infringe upon the intellectual property rights of any third party. or call Enigmatic-07034198264, Omoyele-08063348863, or Samuel-07030874764.